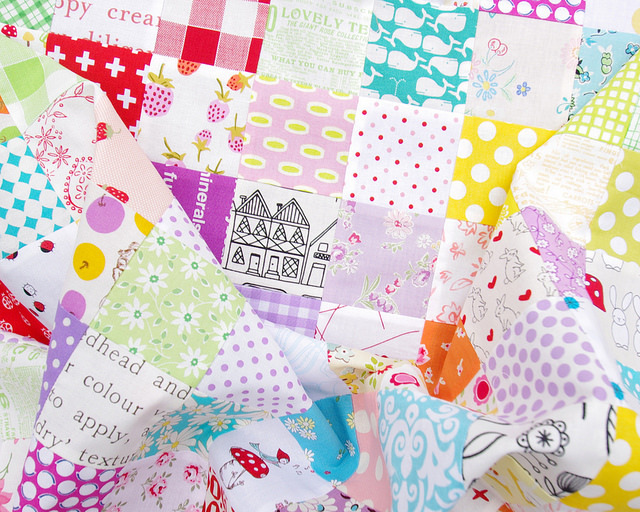 Oh, how I love the fabric that is patchwork! This quilt is an custom order for a three year old girl. Can you imagine? Such a lucky little girl, and one that knows what she likes. A Checkerboard Quilt was ordered and my instruction for the overall color palette was "we love color". What a dream customer. 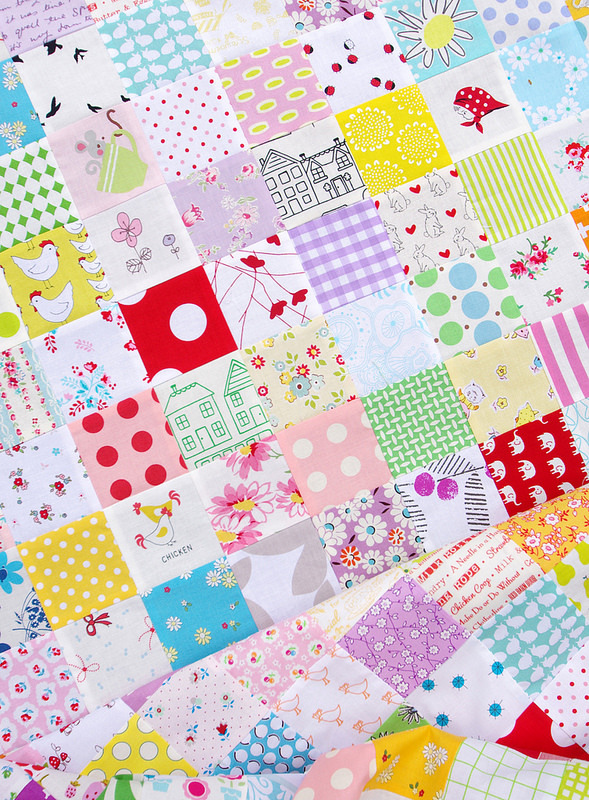 I too love color, and patchwork, and all the cute fabrics that I can pour into this quilt to make it extra special. The last few days or so I have been busy working my way through my stash, cutting and finally sewing. I have included many fabrics that are sure to entertain a three year old child, from bunnies, birds, and bugs, to chickens, elephants, flowers, mice in teacups, and so much more. Note also that this sweet girl loves the color purple ... and I am pleasantly surprised to see just how many purple fabrics have made their way into my stash. That sure has changed. 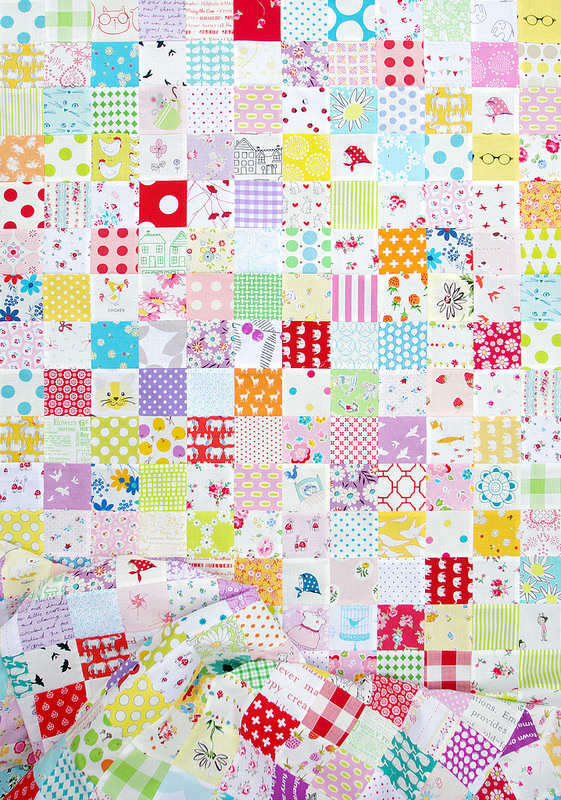 A selection of more than 200 different quilting cottons make up this quilt. Quilt top measures 60 inches x 80 inches. This quilt was strip pieced because it is an efficient and methodical way to sew together what would otherwise be 768 individual squares of fabric. This can sometimes result in a less than random overall look. 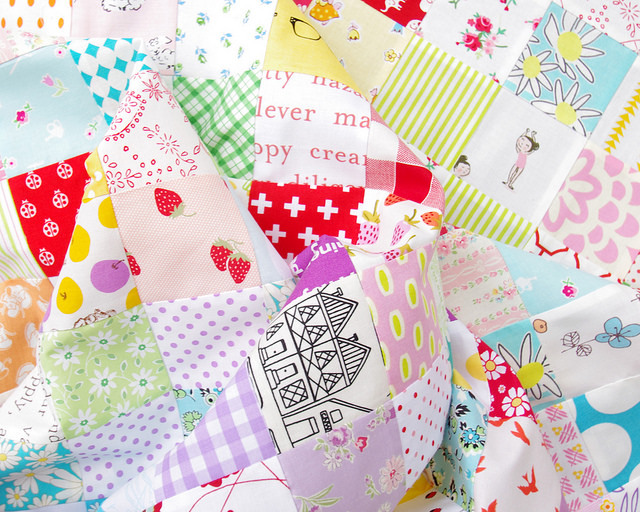 One way to ensure that this doesn't happen is to sew additional sets that are individually pieced; most of the fabrics that have been fussy cut - for example the Kerchief Girl and the Glasses - have been individually sewn together into a rows of four squares that are then incorporated into a 16-patch block. This quilt top is now ready for basting and quilting. 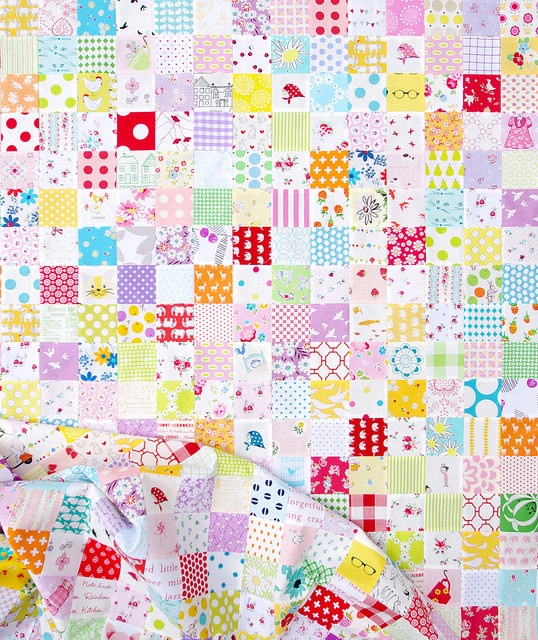 What a great quilt for this little girl, I am pretty sure she's going to love it, looking for the different images, she will enjoy playing and making stories also!! I like the tip about how to keep it feeling more random. I was wondering about that exactly. 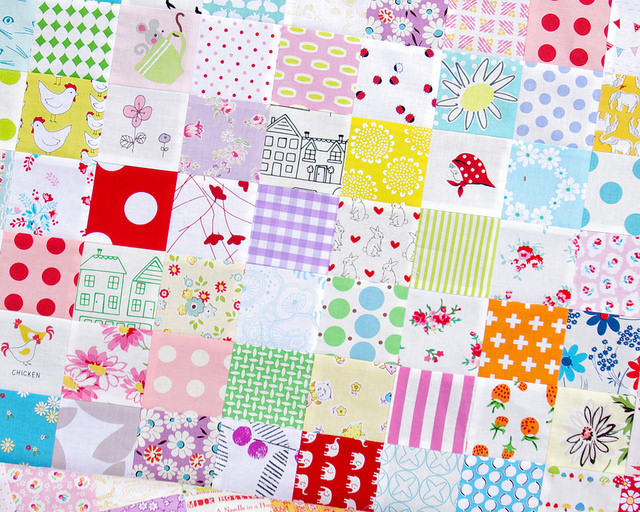 I love this quilt, what a great collection of prints. Thanks for the random tip. I too am trying to use my stash and those favorite fabric. I'm also trying to take a bit of time and cut scraps down into 2.5" squares. Sewing time is precious and fabric is expensive so I'd rather use up the 2.5" squares than look at a bag full of scraps. Thanks for the eye candy! What a fun quilt! 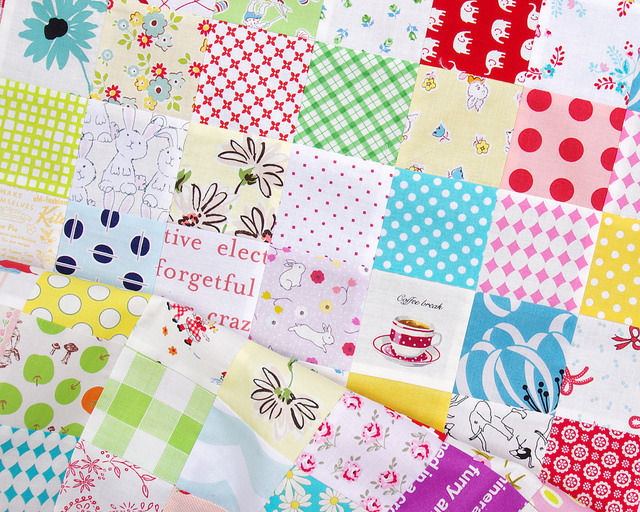 She's going to have a wonderful time looking at all the treasures you tucked into this quilt, made just for her! It's Perfect! 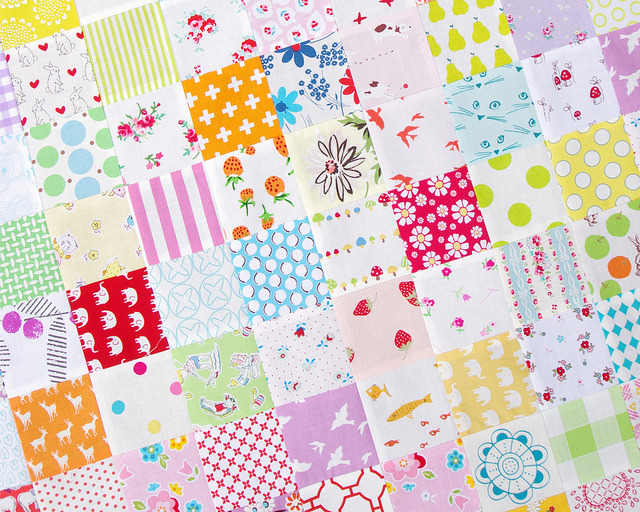 These quilts are your signature patterns and you do them better than anyone! When I see similar quilts done I know they were first done by you. The little girl will Love it! Another beauty, Rita!! 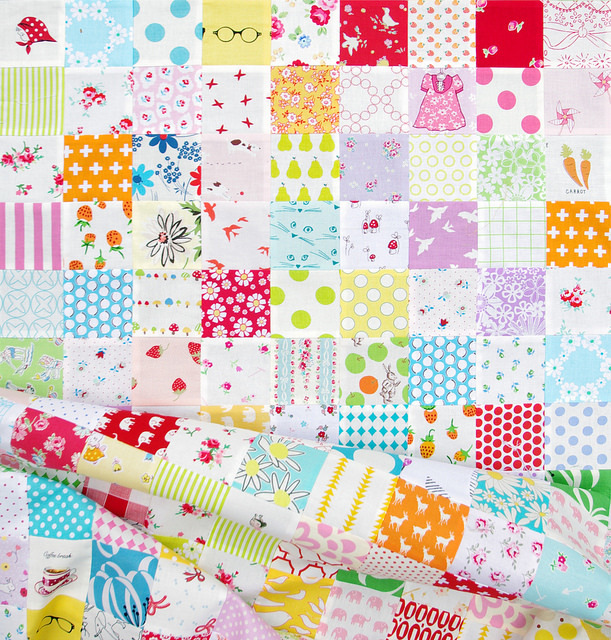 I see so many fabrics that I own in this quilt, and so many that I don't SIGH! I have now made a practice of saving squares so that someday I might produce a similar prize. What a lucky little girl. And this is so charming I'm sure she'll love it when she is more of a "big girl", too. I am working on sorting all of my fabrics. I am setting aside some fabrics for fidget quilts for the oldsters with Alzheimers at my parents Ashby Ponds community. I am excited to do that. Oh! 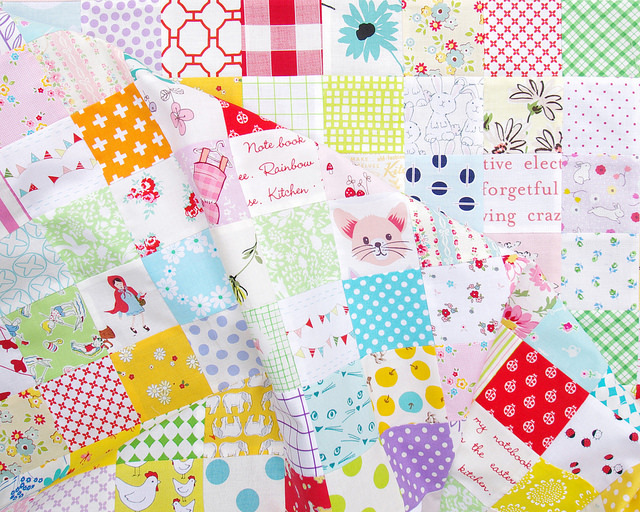 One patch quilts are the scrappy best thing in the whole world! Love the colors too! cheers! Beautiful,I am envious of your special fabrics. It's so pretty! You are such an inspiration, thank you for sharing this with us. Just discovered your blog. Lots of inspiration. These are just the types of quits that I love the most. Thank you! One lucky little girl... Just whimsical!!!! She will treasure this quilt always!